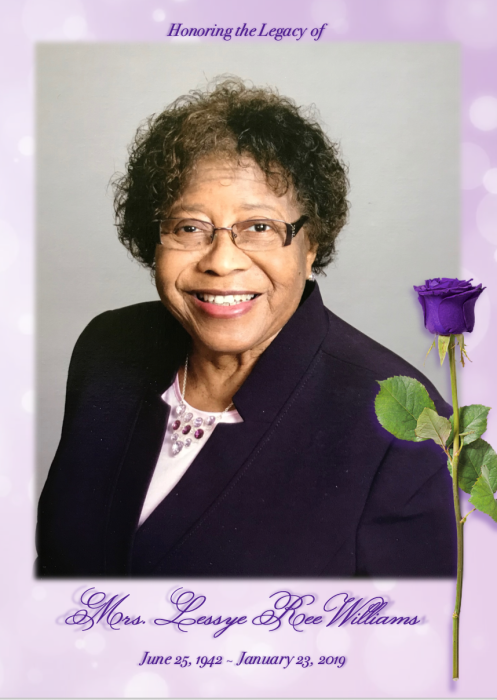 Obituary for Mrs. Lessye (Bryson) Williams | Mack Eppinger & Sons Funeral Service, Inc.
Mrs. Lessye Bryson Williams, 76 of Cartersville, Georgia passed away on Wednesday, January 23, 2019, surrounded by her loving family. Funeral service will be held on Sunday, January 27, 2019 at 3:00pm at St. Luke A.M.E. Church, 130 Jones Street, Cartersville, GA. 30120, The body will lie in state in the church from 2:00pm until the hour of service. Interment will follow in Providence Cemetery, 165 Old Tennessee Road NE, Cartersville, GA 30121. The family will receive friends on Saturday, January 26, 2019 from 6:00pm - 7:00pm at the Mack Eppinger and Sons Funeral Home, 210 North Bartow Street, Cartersville, GA 30120.